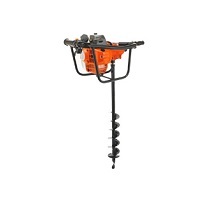 The RedShed team is proud to offer a range of post hole diggers and earth augers that help you to properly imbed posts and pickets deep into the ground. We stock products from many of the country’s leading brands, including Christie, Tanaka and Husqvarna. We also stock a number of lower priced options to ensure that your budgetary requirements are met. In the past, only two man options were available. The Melbourne’s Mower Centre team has recognised this problem, which is why we ensure that one man machines are also available when needed.